The Barretto sisters clashed last Saturday night with their respective drama programs from rival networks. But the older Barretto became victorious in the ratings. Gretchen Barretto‘s Maalaala Mo Kaya episode on ABS-CBN garnered 21.5% while Claudine Barretto‘s drama anthology on GMA-7 received 16.6%. In the daytime race, Eat Bulaga!, Wowowee and Showtime are in tight competition for the no. 1 slot from Wednesday to Saturday. 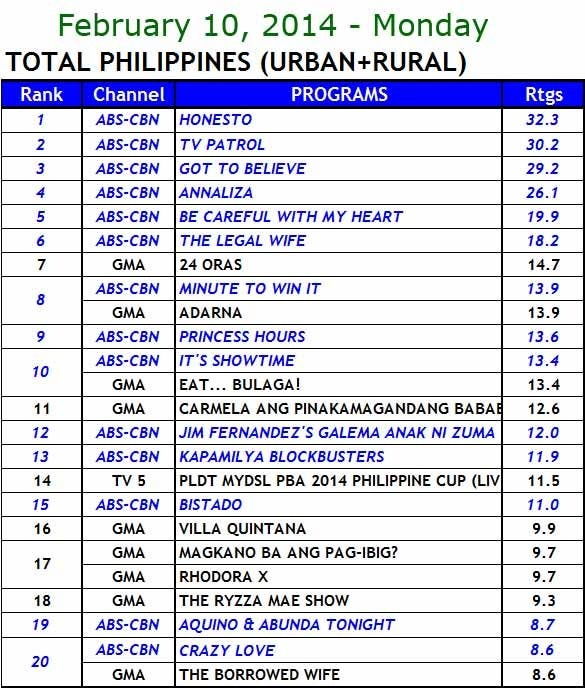 It’s also interesting to note the kapuso soap Gumapang Ka Sa Lusak climbed to no. 2 last Thursday. Pinoy Big Brother Teen Clash of 2010, on the other hand, debuted last Saturday at no. 4. Saturday’s primetime leadership was held by Kapuso Mo, Jessica Sojo. TNS National TV Ratings (Oct. 27, 2009) – ABS-CBN Captures Top 5!